Recently I’ve had the pleasure of meeting Lucia Solis, a fermentation expert who cut her chops in the wine industry. Lucia has been working in coffee for the past three years as a “coffee-fermentation designer”: she helps mills rationalize, improve, and customize their fermentation process. The old (and current) view of fermentation is that it offers no opportunity for flavor enhancement, only risk. The new view (Lucia’s) is that it’s best not to leave fermentation up to chance, but rather to manage it in a way that helps enhance the final product while decreasing the risk of subpar batches. Surprisingly, some green buyers have criticized Lucia's efforts, and seem scared that intentional fermentation design will either decrease the diversity of coffee flavors available, or somehow "ruin" coffee. Many new ideas are a little scary at first, but I'll support any new idea that promises to protect farmers from some risk, makes one small step in processing more predictable, and gives a processor a new tool in her toolbox. Please read what Lucia has to say and decide for yourself. We’d love to hear from you. P.S. I've arranged with an excellent roaster-friend in NYC to provide 250g bags of roasted coffee from Lucia's upcoming project in El Salvador. The beans will be roasted and available for sale around the first week of December. Please send me an email at scott@scottrao.com if you'd like to buy a bag. I do not have specifics yet about pricing or date, but I will get back to you as soon as I do. Supplies will be limited. My work as a winemaker and now as a coffee-fermentation designer centers on one simple truth: fermentation creates chemical compounds with sensory characteristics. I was primed to focus on microbes due to my background in winemaking. I got my degree in Viticulture and Enology at UC Davis and worked for nearly a decade in wineries in Napa Valley, California before my background in microbiology and fermentation brought me to the coffee industry. Today, I travel to mills and coffee farms across Central and South America where I work directly with producers to change the way they process coffee. One way that roasters show diversity of flavor is to offer coffees from different parts of the world. This practice emphasizes regional differences that highlight the effect of geography but minimize the role of post-harvest processing in flavor development. Most of the difference between coffees is usually attributed to cultivars, climate and growing conditions, but the contribution by microbes is frequently overlooked. The tiny microbes (yeast and bacteria) that transform the cherry fruit into parchment have the potential to impact flavor in a big way. Turning the cherry into green coffee ready for roasting is a multistep process. Each step provides an opportunity to impact flavor and quality. 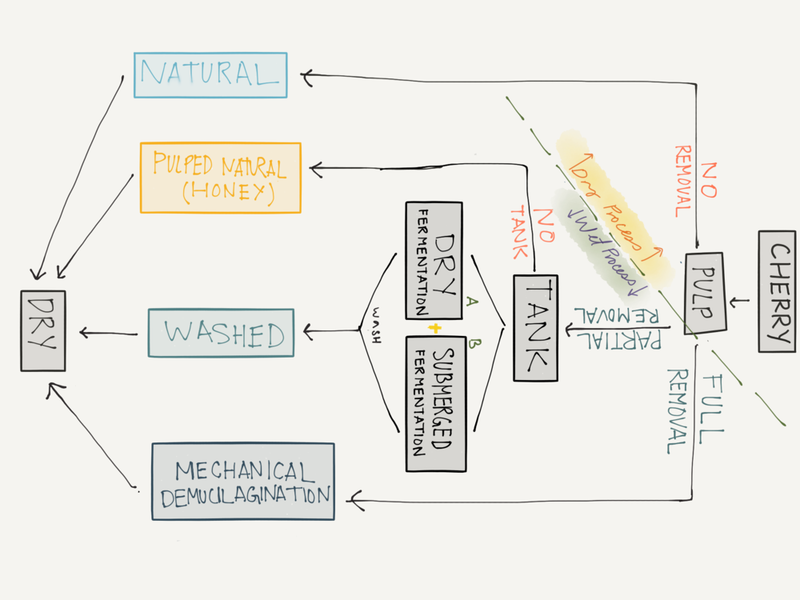 We have only a handful of words to describe processing methods, for example washed, wet, honey, or natural, but each of these words can encompass very different and complex steps. The steps and time involved in what someone would describe as “washed” process vary wildly based on the climate, altitude, cultivar, ripeness, tank design and myriad other variables impacting fermentation kinetics. A coffee could spend anywhere from 8 hours to 72 hours in contact with the mucilage (fermenting) before it is washed. The words “fully washed” might not even mean that a coffee was fermented – but even if you know with certainty that it had been fermented, a coffee dry-fermented for 8 hours will likely taste different from one fermented underwater for 40 hours; or one fermented at 700 meters altitude (MASL) at 80°F versus 1500 MASL and 55°F; or one fermented in wood versus ceramic tanks. And so on. Not only do the words we use to describe the process lack specificity, there is little known about the flavor effects of different processes’ steps or the microbes involved during those steps. This is the focus of my work. Before I could change the way coffee was physically processed by highlighting the effects of the microbes involved, I had to update producers' definition of “fermentation”. I had been trying to educate producers about the flavor effects of different strains of yeast and bacteria, but I was getting nowhere. 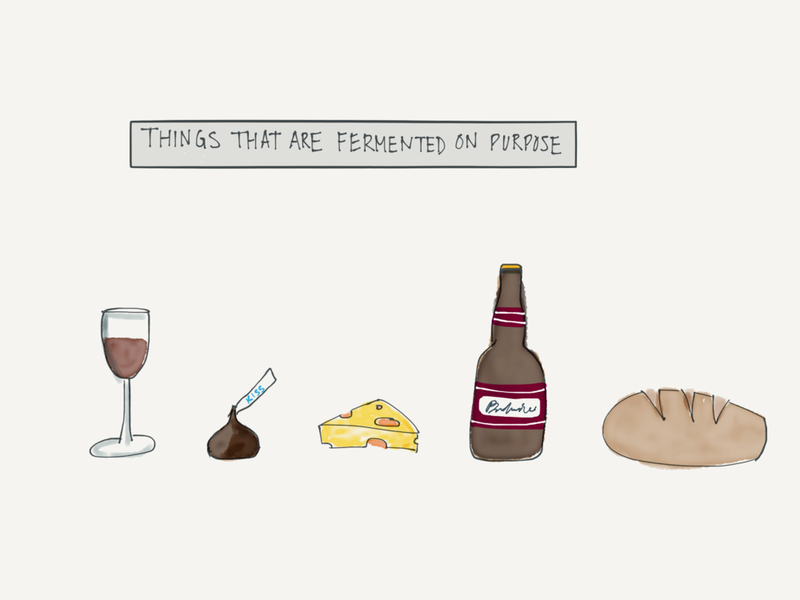 I finally realized few people understood the value of fermentation in the first place. I was using the word “fermentation” to describe a metabolic process whereby yeast and bacteria transform sugars into energy and flavor compounds. Yet the most common working definition for coffee purposes was “the step where the pulped coffee sits in a tank until the mucilage falls off”. This was like trying to teach roasters to roast with a declining rate of rise and realizing that they don’t understand the effect the thickness of the probe has on that curve. In the wine industry, fermentation is extensively studied because it is a necessary step in winemaking: you can’t have wine without it. I noticed the coffee industry used the same word, but it had a very different meaning to almost everyone I talked to. I think the main reason for the discrepancy is that “fermentation” is optional in coffee; it’s just one method of isolating the seed from a cherry. In addition to being optional, it is also not restricted to a single process as commonly thought. Fermentation is not only happening in tanks with wet process/washed coffees, it is an element in honey and dry/natural processed coffees as well. In every process where fermentation occurs there is the opportunity to impact flavor. Fermentation begins the moment that microbes, which exist on virtually every surface, find an entry point into the fruit. The opportunity for fermentation happens as soon as the fruit is picked or when there is damage to the skin (exposing juice) while the cherry is still on the tree. To address the risk of a spontaneous fermentation in winemaking, some wineries pick at night (the coolest part of the day, to slow down microbial action), spray their grapes with sulphur dioxide to inhibit the wild yeast population coming in from the field, or store picked grapes in dry ice until they are ready to begin the fermentation with known and selected microbes. Fermentation is a natural process that happens without human intervention. Winemakers actively chose whether they will risk a spontaneous fermentation or select their microbes and control the process. Even if they choose to use wild yeast and not commercial yeast, they are still making a decision that actively impacts flavor. Most commercial producers of fermented products (wine, bread, cheese, beer, chocolate) inoculate their fermentation. Inoculation is rare in the coffee industry because the focus has been on reducing the risks of processing, and the rewards have been poorly understood. Wine, chocolate, cheese, beer and bread, a few examples of other industries that harness the power of microbes to achieve a desired outcome. The coffee industry defines “processing” as the time between picking a cherry and sending it to dry, usually in the form of either a whole cherry (dry/natural process) or as parchment (wet process). The cherry skin serves as a protective boundary for the seed, and once removed it leaves the coffee seed vulnerable to spoilage. Most literature stresses the importance of expediting processing to reduce the likelihood of damaging or lowering the quality of the coffee. Extending the time between cherry and dried seed is seen as risky for quality. That is: the traditional paradigm suggests that fermentation offers no opportunity for flavor enhancement, only risk. Traditionally the path from coffee cherry to dried green coffee was fraught with risk. The conventional wisdom has been to minimize fermentation time in order to reduce the vulnerability of the seed. An alternative method is to control and extend fermentation to yield positive flavor attributes while mitigating risk. Though we can’t see microbes with the naked eye, we know they influence taste and aroma because we notice their impact when the fermentation goes wrong: we taste this in the form of cup defects. This explains the push for mechanical demucilagination by some experts such as Sivetz and Flavio Borem. At best, in this view, processing merely maintains the inherent quality of the fruit. Flavor metabolites are basically yeast and bacteria farts. Which would you rather your coffee marinate in? But what are the rewards? We know that processing can impact flavor in positive or interesting ways: this explains the ubiquity of honey-processed coffees and the presence of dry-processed coffees on offering sheets. That is to say, we know dry-processed coffees taste different from wet processed coffees, so clearly, processing impacts flavor – enough that some people reject all coffees processed by particular methods. Producers can continue to rely on luck or choose to harness the power of the microbes that influence flavors in the cup. Let me alleviate the fear that if more producers select their microbes, coffee flavors would be homogenized. The cultivar, sugar and nutrient levels in the fruit, shape and material of the tank, ambient temperature, water quality, length of contact time and other factors will still impact fermentation. This means that we don’t eliminate diversity of flavors–but we decrease the occurrence of undesired flavors. I reject the view that processing is simply about maintaining quality or reducing defects. I believe that certain practices like controlled fermentation can enhance and add value to coffee. Properly fermented coffee is a more complex and valuable product than coffee that has been mechanically demucilaged. Fermentation fundamentally transforms the raw materials by creating new flavors. Like brew masters, instead of waiting a year with a barrel open to the environmental conditions and not knowing whether the results will taste delicious or like skunk water, producers can treat their coffee like a kettle sour and get the same flavors consistently. We use microbes to break down the nutrients in the mucilage and produce desirable metabolites. We brew a delicious “wort” and allow the coffee to sit in it past the point of a traditional ‘fermentation’, allowing the seed to absorb the wort and those flavors. Careful choice of microbes can protect the coffee from spoilage and pre-select the metabolic products we want – the ones that taste and smell good. Controlling fermentation is key to harnessing the power of processing to create positive attributes. Fermentation, a biological process that occurs in every form of processing, is an opportunity to impact flavor, and all the steps from the farm to the patio can impact the quality and consistency of coffee. By understanding the power of fermentation and processing, producers and roasters can ensure diversity of flavors while improving the consistency and quality of coffee.